Image Backups Failing - "Backing up System Reserved (SYSVOL) partition failed." I’m currently running Urbackup Server 2.3.8 on a bare-metal Server 2016 Standard system, with Stablebit’s DrivePool software creating a virtual disk to store backups/media. I have five Windows 10 Pro clients running 2.3.4 that can backup files fine (full and incremental), but all clients are failing to create image backups. From the web UI, it provides the error “Backing up System Reserved (SYSVOL) partition failed. Image backup failed”. 2019-04-01 19:30:19: Done updating statistics. Following some Googling, I’ve tried disabling 8dot3names on both the clients and the server, with no change in behaviour. 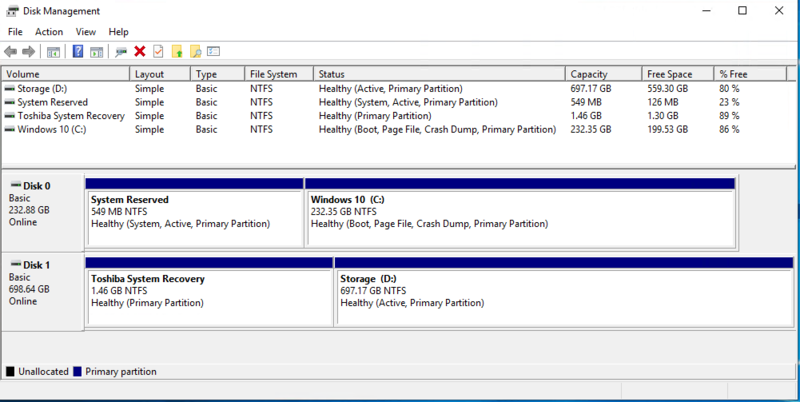 Here is a screenshot of Disk Management for this particular client. For another client, I tried mapping the System Reserved to drive letter V:, and got a different message. 2019-04-01 19:40:25: Writer Task Scheduler Writer has failure state VSS_WS_STABLE with error S_OK. 2019-04-01 19:40:25: Writer VSS Metadata Store Writer has failure state VSS_WS_STABLE with error S_OK. 2019-04-01 19:40:25: Writer Performance Counters Writer has failure state VSS_WS_STABLE with error S_OK. 2019-04-01 19:40:25: Writer System Writer has failure state VSS_WS_STABLE with error S_OK. 2019-04-01 19:40:25: Writer ASR Writer has failure state VSS_WS_STABLE with error S_OK. 2019-04-01 19:40:25: Writer Shadow Copy Optimization Writer has failure state VSS_WS_STABLE with error S_OK. 2019-04-01 19:40:25: Writer Registry Writer has failure state VSS_WS_STABLE with error S_OK. 2019-04-01 19:40:25: Writer COM+ REGDB Writer has failure state VSS_WS_STABLE with error S_OK. 2019-04-01 19:40:25: Writer MSSearch Service Writer has failure state VSS_WS_STABLE with error S_OK. 2019-04-01 19:40:25: Writer WMI Writer has failure state VSS_WS_STABLE with error S_OK. 2019-04-01 19:40:27: Writer Task Scheduler Writer has failure state VSS_WS_STABLE with error S_OK. 2019-04-01 19:40:27: Writer VSS Metadata Store Writer has failure state VSS_WS_STABLE with error S_OK. 2019-04-01 19:40:27: Writer Performance Counters Writer has failure state VSS_WS_STABLE with error S_OK. 2019-04-01 19:40:27: Writer System Writer has failure state VSS_WS_WAITING_FOR_BACKUP_COMPLETE with error S_OK. 2019-04-01 19:40:27: Writer ASR Writer has failure state VSS_WS_WAITING_FOR_BACKUP_COMPLETE with error S_OK. 2019-04-01 19:40:27: Writer Shadow Copy Optimization Writer has failure state VSS_WS_WAITING_FOR_BACKUP_COMPLETE with error S_OK. 2019-04-01 19:40:27: Writer Registry Writer has failure state VSS_WS_WAITING_FOR_BACKUP_COMPLETE with error S_OK. 2019-04-01 19:40:27: Writer COM+ REGDB Writer has failure state VSS_WS_WAITING_FOR_BACKUP_COMPLETE with error S_OK. 2019-04-01 19:40:27: Writer MSSearch Service Writer has failure state VSS_WS_WAITING_FOR_BACKUP_COMPLETE with error S_OK. 2019-04-01 19:40:27: Writer WMI Writer has failure state VSS_WS_WAITING_FOR_BACKUP_COMPLETE with error S_OK. 2019-04-01 19:40:55: Writer Task Scheduler Writer has failure state VSS_WS_STABLE with error S_OK. 2019-04-01 19:40:55: Writer VSS Metadata Store Writer has failure state VSS_WS_STABLE with error S_OK. 2019-04-01 19:40:55: Writer Performance Counters Writer has failure state VSS_WS_STABLE with error S_OK. 2019-04-01 19:40:55: Writer System Writer has failure state VSS_WS_STABLE with error S_OK. 2019-04-01 19:40:55: Writer ASR Writer has failure state VSS_WS_STABLE with error S_OK. 2019-04-01 19:40:55: Writer MSSearch Service Writer has failure state VSS_WS_STABLE with error S_OK. 2019-04-01 19:40:55: Writer Shadow Copy Optimization Writer has failure state VSS_WS_STABLE with error S_OK. 2019-04-01 19:40:55: Writer WMI Writer has failure state VSS_WS_STABLE with error S_OK. 2019-04-01 19:40:55: Writer Registry Writer has failure state VSS_WS_STABLE with error S_OK. 2019-04-01 19:40:55: Writer COM+ REGDB Writer has failure state VSS_WS_STABLE with error S_OK. 2019-04-01 19:40:56: Done updating statistics. 2019-04-01 19:40:57: Done updating statistics. 2019-04-01 19:42:07: Done updating statistics. Looks like that Stablebit DrivePool thing does not support FlushFileBuffers(). Thanks for the quick response. Seems I’ll have to see about moving the backup location to some other storage solution.